Financial support for the local expenses of a limited number of junior participants (typically post-doctors and Ph.D. students) is available. Application statements and curriculum vitaes should be sent to Mr. Xiaoyu Chen before September 10, 2011. If you need an official invitation letter for visa application, please send your information (title, name, address, and position for attending MACIS 2011) to Mr. Xiaoyu Chen. Then an electronic scanned version of the invitation letter will be sent to you via e-mail and if necessary the source will also be sent to you by mail. 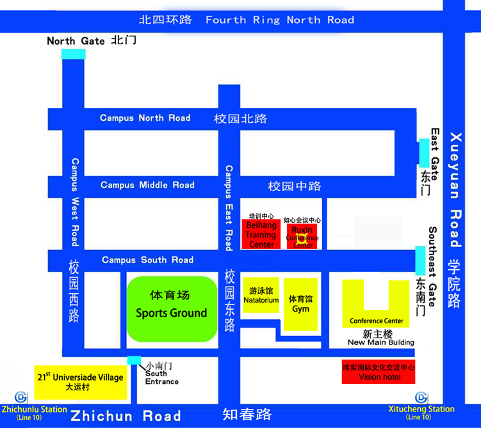 MACIS 2011 will take place at the Ruxin Conference Center of Beihang University. 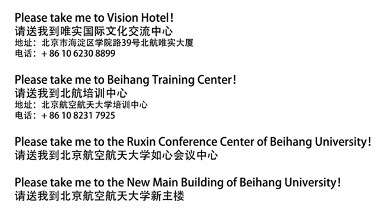 Rooms at Vision Hotel and Beihang Training Center can be reserved using the MACIS conference registration form. It takes about 6 and 2 minutes respectively to walk to the conference site from these two hotels. Standard room rate of Vision Hotel is 488 CNY per night (with breakfast for one person), while that of Beihang Training Center is 280 CNY per night (with breakfast for one or two persons). Vision Hotel is recommended because the waiters there can speak English and the rooms are more comfortable. The map below illustrates where these two hotels and the conference site are located. The currency exchange rate of USD and CNY is about 1:6.5. Foreign currency is not acceptable in most cases. You can do currency exchange at the airport, Vision Hotel, and nearby banks. Beijing Capital International Airport is about 30 kilometers away from the conference site. You may take either taxi or shuttle bus there to your hotel. The taxi fares in Beijing are quite affordable and you pay exactly the amount shown on the taximeter. It costs about 100 CNY from the airport to your hotel. You are advised to keep the receipt, which could help you find the driver when necessary. You may print the following notes and show them to taxi drivers. Beijing has a large variety of moderately priced Chinese restaurants, but the waiters in most of these restaurants do not speak foreign languages. If you like adventure and unexpected experience, you may just go there and try. Otherwise, you may find MacDonald and KFC in various places where you know how much you pay (less than what you usually do) and what you get, or go to restaurants in star-ranked hotels where the waiters can speak English. Vision Hotel and big shopping malls may accept international credit cards. Except those specialized for international guests, most grocery stores and restaurants only accept Chinese currency in cash. The climate of late October in Beijing is usually comfortable. The mean temperature is about 15°centigrade or 59°Fahrenheit and the highest temperature may reach 20°centigrade or 68°Fahrenheit. Occasional winds and rains are possible. In general, Beijing is a quite safe city. We remind you to watch out both automobiles and bikes when you cross streets. Some pedestrians and bikers in Beijing ignore all kinds of traffic lights, signs, and barriers. Please do not follow them to cross streets. You may ask the reception desk for Internet connection and other information about your stay at the hotel and in Beijing. If you take an international flight, please arrive at the airport two hours before the time of departure. You may take a taxi at Vision Hotel and it takes about 50 minutes to arrive at Beijing Capital International Airport. If necessary, you may print the following note and show it to the taxi driver.